diary of a crazy person: Big News! Most, if not everyone who reads this blog is also friends with me on Facebook, so this is probably old news. BUT, I want to share it here too! 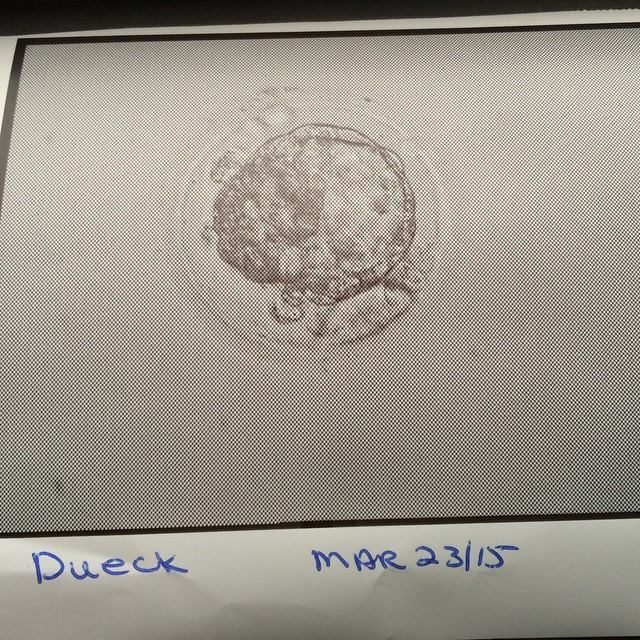 March 23rd, we transferred that beautiful embryo pictured above, and a week later we had a positive pregnancy test. My initial feelings were relief. It had been such a long, emotionally draining road and it was finally over. We could finally celebrate. Two weeks ago we had a scare. I started cramping and bleeding. I called Heartland and they had me come in the next morning for an ultrasound. The bleeding had stopped by the morning, and the U/S looked normal for how far along I was. I have another ultrasound April 27th. We should be able to see the heartbeat by then! I cannot wait. I have been feeling very tired and nauseous lately. I wasn't really sick with Tallet, so this is new for me. It is an interesting challenge with a toddler to chase after this time around. But nevertheless I am thankful for it. It (hopefully) means this bean is growing strong in there!